Read the Kindle edition on Kindle, iPhone, iPad, Android, BlackBerry, PC and Mac. Start reading The Price of Admission on your Kindle in under a minute. Donï¿½t have a Kindle? Get your Kindle here, or download a FREE Kindle Reading App. Only 19 left in stock--order soon (more on the way). “The Price of Admission is perfect for those curious about what goes on in college admissions offices because it shatters assumptions about acceptance to elite colleges. . . . The Price of Admission forces the reader to wonder how affirmative action can be deemed controversial when favoritism of the white and wealthy is overly prominent in elite colleges. . . . [F]or those interested in the injustices in higher education, this book is a must-read." While it's widely believed that the rich and powerful can buy their way into top colleges, this book replaces rumor with hard evidence: dozens of specific, juicy examples, captured with a Pulitzer Prize winner's journalistic precision. This is a difficult job, since it can rarely be said with certainty that someone would not have been accepted without their big financial donation or famous parent. Golden understands this, and doesn't stretch facts or pound points. He just presents dozens of cases of apparent corruption, letting the facts speak for themselves. The author repeatedly contrasts the academic records of wealthy students who were accepted with the records of better but poorer students who did not get in at the same college in the same year. Sometimes, these stories are even supplemented by internal evaluations made by the admissions offices themselves -- as when Golden notes that Senator Bill Frist's son got the lowest possible rating from Princeton's admissions office for academic achievement, and was admitted anyway. While it is standard for college admissions staff to point out the "complexity" and "context" of each case to defend seemingly incongruous outcomes, the author makes these acrobatics difficult with his relentless stream of examples and hard facts. Golden manages to weave this rigor and precision into a sharp, interesting narrative, moving easily from Princeton and Harvard's affinity for the undistinguished and undisciplined sons of Bill Frist and Al Gore to Brown University's pandering to the children of movie stars to Duke's wooing of the children of the rich. It is a juicy read. Undoubtedly, at least part of what drives this book is the author's muckraking anger. He admits to being outraged on behalf of the Asian students who have to meet higher standards than the wealthy children of white donors and politicians. This outrage, from my perspective, was a plus and not a minus. Golden's idealism is also evident in the positive chapter about Caltech, The Cooper Union, and Berea College, three institutions where wealth, connections, and power play no role in admissions. He lauds Caltech for being one of the nation's best private colleges despite having an admissions process based on merit alone. It is certainly tempting to believe that this purist idealism could spread to other institutions, too. Still, everybody admits that giving handouts like easier admission is a simple way for universities to cozy up to money and power. Golden is honest about the fact that the only way to deal with corruption in the long run is to institute conflict of interest rules similar to those which exist in law school admissions and other fields. This is a smart, scathing, provocative, and angry book that shines a bright light on affirmative action for the rich and is guaranteed to produce some embarrassing questions for those who perpetuate it. After reading this book I was embarrassed by my naivety. I had always thought that our country's "premier" colleges were special places where the best and brightest gathered. Obviously that is not the case. The admissions practices outlined in the text appeared to me to be little more than discrimination by wealth. I must confess I am very grateful to Mr. Golden for writing this book. As disturbing as it was to read, I could not put it in down. It has changed the way I look at higher education, the business world, and politics. In the future when I see the resume of a CEO or political leader I will be looking for a state university as a mark of merit and real world experience. 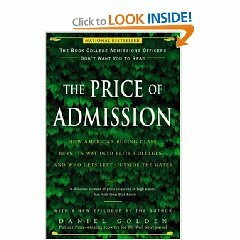 Daniel Golden's The Price of Admission is a ten star read on Amazon's five star scale-- a triumph of hard-hitting investigative reporting combined with thoughtful suggestions on potential reform of college admissions policies. The thesis of The Price of Admission is simple: a talented "unhooked" student is at a disadvantage in gaining admission to a prestige college, versus less talented alumni legacies, the scions of wealth ("development admits"-- while colleges may contend that admissions are "need blind" with respect to students, the colleges' own financial needs are keenly considered during the admissions process), faculty and staff children, and players of sports of wealth favored under the federal Title IX program, such as crew, polo or lacrosse. The only edge favoring "unhooked" studients is the preference for federally-designated minorities, including blacks, Hispanics and Native Americans-- a group that excludes Asian Americans and poorer immigrants. Golden proves his thesis handily, using both broad-based admissions statistics and individual case studies. To my mind, Golden's willingness to name names and cite individual cases is a plus-- it is hard to brush off repeated instances of highly-credentialed "unhooked" candidates denied admission for less-talented but better connected children of donors, celebrities and alumni. As a result, this volume is a must-read for college admissions counselors, parents and college applicants. The sting of a college rejection of a talented "unhooked" student will hurt less if the context of that rejection is understood more fully. And perhaps the lure of the Ivy League plus Stanford and Duke will abate a bit if the public realizes that admissions to these institutions are hardly decided on a level playing field. Especially heartbreaking in The Price of Admission are the stories of top tier students, frequently but by no means uniformly Asian American, rejected at multiple Ivies, while lesser-credentialed but better connected classmates are admitted. Poor foreign immigrants and, ironically, unhooked applicants whose parents have sacrificed to move to strong public school districts or to send their offspring to elite private schools (where they are more likely to compete with "hooked" classmates), are also disadvantaged in college applications. The Price of Admission offers must-read information for such students and families by helping them to realize that the college admissions process is biased and that rejection from top colleges does not signal personal failure. On the basis of personal experience, I would also suggest that talented students who are not admitted to Ivies will typically do well in life on the basis of their talent and drive, and should not let college admissions decisions define them. Golden also highlights three colleges that do not admit on the basis of alumni preference, family wealth or athletic prowess, illustrating that alternative admissions systems can work effectively. Cooper Union admits strictly on academic and artistic merit, while Caltech admits solely on mathematical and scientific ability. Berea College, which serves a need-based population in the Appalachian Mountain area and in part of Ohio, admits students on the basis of merit, financial need and place of residence. The stories of Berea, Caltech and Cooper Union demonstrate that alternative admissions policies can and should flourish. Golden concludes The Price of Admission with recommendations for moving college admissions more fully in the direction of merit. Many of his recommendations are thoughtful ones and deserving of careful consideration by college admissions staffs and policymakers. Altogether, a ten star read on Amazon's five star scale. Recommended with keen enthusiasm. Golden's research ability and ability to write is clearly superior than the any journalist working in mainstream American journalism that I know. Please understand--I'm one of the "non-elites" who got passed over, and wound up going to Podunk State instead. That being said--this book is pretty bad. 1.0 out of 5 stars Duh! Why would it come as a surprise to any observer that the rich and famous can gain entry to our elite colleges? However, this fact misses the point. I loved this book. It lays bare the admissions process of the ivy league and "better" colleges and helps people re-think the status of those institutions. 5.0 out of 5 stars Daniel Golden: great job! I'm going to start buying the Wall Street Journal again! Published on April 12, 2008 by H.
Front Cover | Table of Contents | First Pages | Index | Surprise Me! Kindle Books Selected Bargains from Best Kindle Reads: A list by Mehmet Gok "MBA PMP"
Read Freaky Books on Kindle: A guide by Tim Lieder "Founder of Dybbuk Press"
SET ASIDE SOME TIME TO READ - KINDLE and/or BOOKS: A guide by Makayla M. "Makayla "MaMa""